2 murdered in shooting attack at industrial park in Samaria. Terrorist has escaped, forces searching the area. 2 people were murdered and another person wounded Sunday morning in a terror attack in the Barkan Industrial Park in Samaria. Initial details found that the shooter, apparently a 23 year old PA resident of the village of Shuweika near Tulkarem who worked at a factory at the park, entered the factory with a rifle, ascended to one of the upper floors and began shooting. 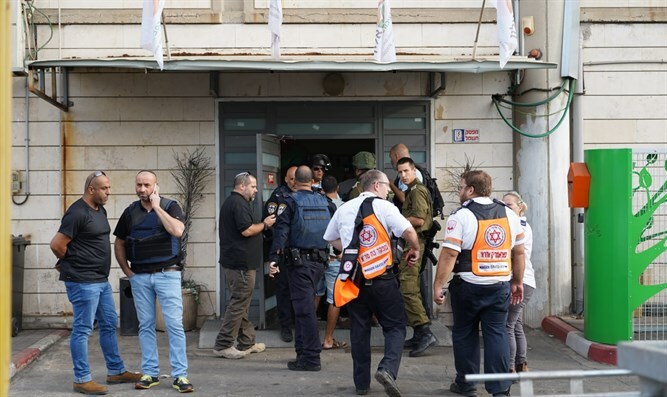 A man and woman in their 30s were murdered, while a 54 year old woman was seriously wounded and evacuated to Beilinson hospital in Petah Tikvah by Magen David Adom (MDA) emergency medical responders. The hospital later announced that the condition of the evacuated woman, who suffered from a stomach wound, was classified as moderate and that her life was not in danger. She was hospitalized for further treatment. The shooter has escaped. Security forces are searching the area for the suspect. MDA medics David Baruchi and Neria Ketua described the scene. "When we arrived, there was chaos at the scene. People shouted that there were wounded persons inside, they led us in to one of the rooms, we saw a man and woman of about 30 lying unconscious without pulse and not breathing. We undertook medical checks, they had no vital signs and we were forced to confirm their deaths." "We searched the scene and found another 54 year old woman under one of the tables. She was fully responsive with a gunshot wound to her upper body. With the help of MDA EMT Hadas Wilps, we extricated her and provided lifesaving medical treatment including hemorrhage control, medications, and we evacuated her to Belinson with severe yet stable injuries. During the evacuation, she was interacting with us, and was able to recount the incident. She also requested that we notify her family, which we did." Ketua added that "On the way to the hospital, the wounded woman related that she had heard noise and gone outside to understand what was happening, and found herself in front of the attacker, who shot at her."